Distance: 120.0 – 140.0 cm x 30.0 – 35.00 cm For green asparagus, the row spacing is 30 cm, for white asparagus it is 40 cm. It is possible to grow green asparagus in all types of garden soil. Required quantities for cultivation: 25 asparagus plants per person. Your need: One person consumes an average of 3.5 kg a year. Asparagus is a perennial shrub, which can grow for 12 to 15 years. It is not newly planted every year. In spring, the rootstock (rhizome) beneath the soil produces several shoots which are harvested as asparagus. Asparagus roots grow through the soil to a depth of 1 metre. This grows under the soil in the typical banks of earth or asparagus ridges and is harvested as soon as the surface of the soil just lifts a little and before the plant is exposed to sunlight. This ensures that the asparagus tips remain white and unblemished. - In comparison to white asparagus, the stalks are thinner. 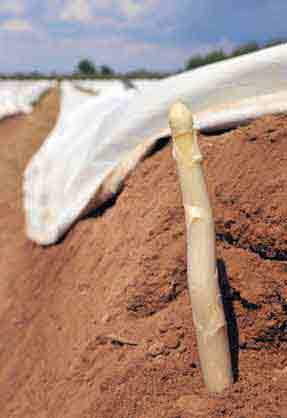 White asparagus likes a sunny location with deep, loose chalky soil or sandy soil which is rich in humus. Green asparagus likes it sunny and protected from wind. It is possible to grow green asparagus on all types of garden soil. Ensure that the soil is well drained. An asparagus plant is propagated by seed. After harvesting the asparagus seed in autumn, an involved process is required to make them able to germinate. For this reason it is best to buy vigorous one year old plants with strong, light roots and 5 to 6 buds, which you plant when creating a new asparagus field. If the foliage is golden yellow - in autumn - you should harvest the red berries. On the one hand this is to obtain seeds and on the other hand to prevent young asparagus plants from proliferating through the garden in spring. Green asparagus is grown without banks of soil (asparagus ridges). This means that it creates less work as it is not necessary to earth up the soil in the beds and harvesting is simpler and quicker. Fertilise the asparagus field at the beginning of spring and after the last harvest. Repair" the asparagus ridges, ideally using sand if necessary. Diseases: Fungal diseases (asparagus rust, grey mould) usually occur during mid to late summer in wet weather. In the year that it is planted, there will be no harvest. In the 1st year after planting you should only harvest for 8-10 days and no more than 1 asparagus stalk per plant. In the 2nd year, asparagus can at most be harvested for 5 weeks so that the young plants can recover. From the 3rd year it is then possible to harvest until 24 June (St John the Baptist's day). When harvesting, care must be taken not to damage the asparagus root. After harvesting, the hole in the ridge must be filled with soil. White asparagus is harvested as soon as the surface of the soil just lifts a little and before the plant is exposed to sunlight. As with good weather asparagus can grow by about 0.75 cm per hour, the asparagus ridges must be checked at least twice per day (ideally early in the morning and in the afternoon). Green asparagus is harvested when it has grown out of the soil by about 20 to 25 cm. Cooled and wrapped in a moist cloth, fresh asparagus can be kept reasonably well for a few days in the fridge. Both raw as well as cooked asparagus are suitable for aparagus salad. One person consumes an average of 3.5 kg a year. Der Pro Kopf Verbrauch liegt etwa bei 3,5 Kilo jährlich. Quellen: BLE; BMELV; DESTATIS; LfL Stand: 14.03.2013 [br /][br /] Man kalkuliert ca. 20 Pflanzen/ Person. Sie bringen im Vollertrag 15 -20 kg/Jahr.